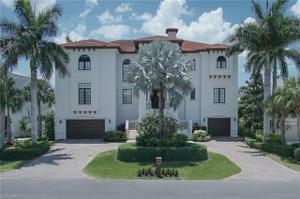 One of the most substantial three-story homes in Vanderbilt Conner’s, located on a highly sought-after street with only 13 residences, this home offers Gulf access with expansive views of Vanderbilt Lagoon. Sited on an oversized lot (90 x 120) with southern exposure, home has over 6,300 sf of living space and a total area of 11,498 sf with 12 rooms including 5 generously proportioned bedrooms and 5.5 baths. Construction is top notch and features concrete block on all three levels, poured concrete floors and high impact glass throughout. Refined finishes include marble and Lauzon wood floors, 2 fireplaces, tray ceilings and crown moldings, built-ins in study and upstairs hall, and a gourmet eat-in kitchen with stainless steel appliances. Large wrap around balconies on the second and third floors, oversized gas-heated pool and spa, mature landscaping and a substantial dock with a 10,000 lb. boat lift are ideal for entertaining. Freshly painted for low maintenance. Owners will appreciate the short walk to Vanderbilt Beach and the close proximity to fine dining, entertainment and shopping at the Mercado and Waterside Shops. An extraordinary home for an extraordinary lifestyle.